Concerns about the negative impact of technology on the labour market are not new. As early as 1817, at the beginning of the first industrial revolution, economist David Ricardo explained how jobs in the English textile industry were being lost as a result of the introduction of automatic weaving machines. The application of new technology in the economy boosts productivity, allowing companies to produce more with less. The gains in productivity reduce the need for workers, destroying existing jobs and occupations. However, economists have also long held that technology supports job creation by raising the salaries of those operating it, and by making production processes more efficient. Increased efficiency reduces the cost per unit of goods produced and also, therefore, their price. As a result, workers have more money in their pockets to spend, which creates more jobs in other industries. Last month, the Asian Development Bank published its Asian Development Outlook 2018, with a focus on how technology affects jobs in Asia. But while the report seeks to explain the ways technology can foster job creation, it does not address how Asian leaders can solve inequalities resulting from technological changes. That is an essential challenge. The Asian Development Bank argues that in Asia, the higher output facilitated by technology will create jobs because new occupations and industries will be created to meet the new demand of consumers. To underpin its logic, the bank uses the distinction created by David H. Autor, which recognises that any given job consists of a bundle of tasks. These tasks can be classified into two dimensions: manual or cognitive; and routine or nonroutine. 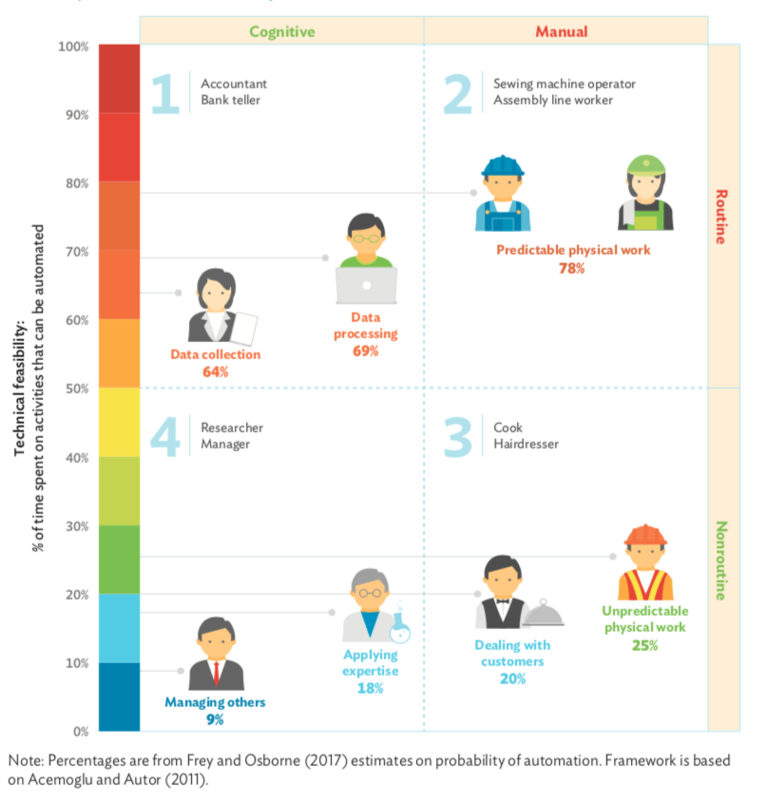 According to Autor, the technical feasibility of automating tasks using machines and computers is higher for cognitive and manual tasks that are routine (see quadrants 1 and 2 in the illustration above). These are the kinds of jobs at risk of displacement by labour-saving technology. Cognitive or manual jobs that are non-routine are “safe” because their tasks are difficult to automate. New technologies complement this labour, but does not substitute it. As a result, the share of employment in high- and low-skilled occupations (mostly located in quadrants 3 and 4) is growing, while the share of employment in the middle-skilled, middle-paying occupations, such as accountants and machine operators, is being squeezed. It is in this category (quadrants 1 and 2) where most routine jobs fall. To understand how this phenomenon is unfolding in Asia, the World Bank’s World Development Report 2016: Digital Dividends offers a useful description. The graph below, extracted from the report, displays changes in employment share in developing economies between 1995 and 2012. 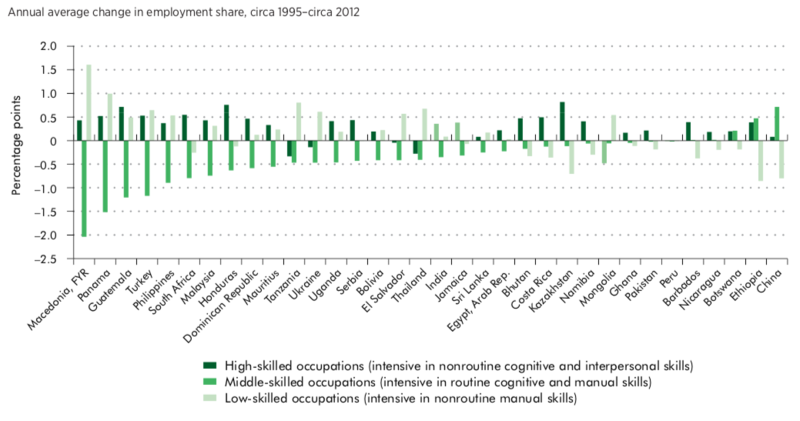 It shows that, during the period, workers in developing countries left middle-skilled occupations (negative variation, in dark green), while the number of workers in low- and high-skilled jobs increased (positive variation, in light green). While these changes might have had a positive effect on overall productivity, they also fostered inequality in the labour market. The main issue is that middle-skills jobs, directly linked to the middle class, are disappearing. Employees in these jobs are moving either to high-skilled jobs that only very few qualify for (those with long experience and degrees), or to low-skilled jobs that face increasing competition and declining wages. the jobs where workers are likely to lose out are disproportionally held by the least educated and the bottom 40% of the income distribution. As a result, the biggest risk from the digital revolution is not massive unemployment, but the growth of income inequality. The Asian Development Bank suggests several policy solutions to this situation. It underlines that governments must act to enhance and adapt skills development, labour regulation, and fiscal reforms. On the skills development side, despite growing access to educational opportunities over the past decade, the quality of education is still low in developing Asia. The Program for International Student Assessment (PISA), a study led by the OECD that assesses educational systems, evaluates most Asian countries as “below” the OECD average for scholastic performance on mathematics, science, and reading. Basic education should be a priority to enable skills adaptability and encourage employment prospects. With respect to labour regulation, the dominance of the informal sector in the region (60% according to International Labour Organization) makes policy interventions difficult. However, based on what is written in labour codes, the average level of employment protection in East Asia is actually higher than the OECD average. The issue is the weak administrative and enforcement capacity of Asian economies. There are few initiatives designed to ensure domestic workers are operating under labour and employment regulations and laws in Asia, and there is still a long way to go to formalise these economies. Finally, the Asian Development Bank recommends tax reforms that would involve broadening the tax base of these countries and/or improving their tax administration. Currently, the share of government revenue in GDP in many Asian nations is very low (in 2016, about 10% below the OECD average of 25%). Latest figures from the World Bank show small improvements, but tax trends in Asia are clearly not skyrocketing. In addition, Asian countries face many fiscal issues, such as tax collection, tax evasion, and a large informal sector. These reforms could support Asian countries’ efforts to deal with inequalities in their labour markets arising from new technologies. However, these measures take time and effort, which makes them difficult, politically and administratively, to implement. The question is, then, whether Asian politicians and policymakers are to up to the task. This the Asian Development Bank report does not say.